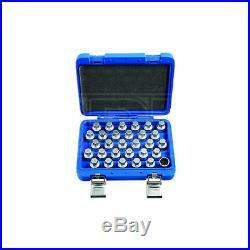 LASER Locking Wheel Nut Key Set - Mercedes Benz - 30pc - Single. Experience is premium in the automotive business, and we have loads of it. Our experts are happy to answer your questions on oil or anything else we stock. Any damages, we replace, no quibbles. GENUINE UK STOCK - FRIENDLY, FREE ADVICE. Master locking nut key set designed for garage and tyreshop use. Supplied in a blow mould case for storage. OPIE OILS was established in 1925 and has been trading on the Internet since 2004. In this time we have become the UK's largest independent online retailer of quality Oils and Fluids. We sell the most comprehensive range of quality and specialist oils for Cars and Bikes anywhere in Europe. We stock engine oils, gear oils, differential and axle oils, brake fluids, power steering fluids, coolants and workshop products from Castrol, Mobil, Shell, Fuchs, Silkolene, Motul, Millers Oils, Millers Classic Oils and Red Line. How long will it take to get my order? The majority of items are held in stock and dispatched from our UK warehouse. Monday to Friday inclusive, unless we contact you to advise otherwise. We may list products which are not held as stock and are special order items. Where can my order be delivered to? We regret that our couriers are not able to deliver to PO boxes, university campuses and military bases. How will I know when my order will arrive? We send hundreds of parcels every week. We know how to pack your parcel so that it reaches you safely. We use high quality, custom made boxes to enable us to pack orders sensibly, offering optimum protection against courier damage. If - despite our best efforts - any order is damaged, we'll replace it without question! We always want you to be satisfied with your order and pride ourselves on our customer service. Our cancellation policy does not affect your rights when we are at fault, e. If goods are faulty or mis-described. If you cancel, you must return the goods to us at your own expense. If a fault is found later on or if you delay in making a complaint you will still be entitled to a replacement. We cannot accept responsibility for additional charges or consequential loss incurred if a product does not fit or does not give the desired results. Our liability is limited to the price paid for the goods only. In the unlikely event we have sent incorrect goods i. Not what you ordered as shown on your order confirmation. When the goods supplied do not fit your vehicle and we provided incorrect guidance to you as to which product/s were suitable. We ask that you return the goods in the original packaging, clean and resaleable. In any circumstance within 30 days of you receiving the goods. In the unlikely event that you are not 100% satisfied then please give us the opportunity to resolve any issues you may have before leaving feedback. To give you an idea, the weight of oil works out around 1 kg per Litre, that's roughly 10 times the weight of a CD 5 litres = 50 CDs! This is to ensure our prices remain as competitive as possible. How long will it take for my order to arrive? The vast majority of items are held in stock and dispatched from our UK warehouse. Which Courier do you use? Please ensure someone is present to sign for the item. How can I return items that I have ordered in error? How do I get my Tracking No? To where can my order be delivered? Why is one synthetic oil so much more expensive than another? There are three types of synthetic oils; Hydrocracked, Polyalphaolefin (PAO) and Ester oils. All cheaper oils and the'synthetic' component of part-synthetic or semi-synthetic oils are hydrocracked mineral oils. PAO synthetics are genuine, lab-made synthetic oils that are better lubricants than hydrocracked oils as they are built for their specific use, rather than the hydrocracked oils that are modified to perform a purpose. Ester based oils are the top end of oil technology and give the best protection available. The ester content (usually ester oils are mixed with PAO oils) has several functions that are very useful. Esters are electrostatically charged so they stick to metal surfaces, meaning that when the vehicle is started, there is already a layer of oil present. They are also more stable at higher temperatures, making them ideal as performance lubricants. The ester content also helps to make those oils better lubricants in general. Is it okay to mix oils? Mixing oil brands, types (synthetic, semi-synthetic and mineral) and viscosities is fine. There are a few exceptions;castor and plant based (as used in some biodegradable oils) are not safe to mix with conventional oils. The only problem with mixing oils is that the quality of the better oil is diluted by the lesser one. Do I need a diesel or petrol oil for my car? In the case of cars with diesel particulate filters (DPFs/FAPs), they will often need an oil that meets an ACEA C specification, which relates to low ash oils. The ACEA specification of an oil is always written on the bottle so long as it meets the spec! The use of oils that do not meet the correct ACEA C specification can result in the particulate filter becoming blocked, an expensive repair. Other than that, there isn't really such a thing as a diesel engine oil as the vast majority of oils are suitable for both petrol and diesel engines, regardless of how they are marketed. If you look at the specifications listed on an oil, there is usually an ACEA A and an ACEA B specification. The A refers to petrol engine specifications and B to diesel. You will see that the numbers next to the letters are either the same or very close, meaning that the oil is suitable for both types of engine. How often should I change my oil? The life of the oil is dependent on many factors. Full synthetic oils last longer than semi-synthetics or mineral oils, so although they may cost more in the first place, a full synthetic can work out as a cheaper option in the long run. Many cars specify the use of full synthetic long-life oils and these may last over 20000 miles or up to 24 months. If the car is used on track, the oil is subjected to far harsher conditions than motorway use. That may mean that a good track oil will have broken down sufficiently to need changing after 10 hours of use, whereas the same oil would be good for over 100 hours of use on motorways. Short journeys are very hard on the oil as it does not get the chance to get warm and flow properly as well as acceleration and deceleration making the engine work harder. Motorway use is the easiest condition for oil, the speeds are fairly consistent and rarely push the engine hard, there is plenty of air flow to help cool the engine and the oil has a chance to get up to temperature and flow properly. Certain engines suffer from fuel dilution (fuel mixing with the oil) and that is one of the quickest ways that an oil can breakdown. Should I use an oil additive? Good quality engine oils already contain a complex additive pack including detergents and dispersants, anti-wear, anti-corrosion and anti-foaming additives. The only additives we sometimes advise using are the limited slip differential friction modifiers, for certain differentials, and engine oil additives to assist in the process of breaking in a new engine. My engine burns oil - should I use a thicker one? It depends on the engine, what sort of use it gets, how much oil is being used and type of oil being used. Certain engines really prefer a specific grade of oil to operate optimally, others aren't so fussy. It's best to ask us if you aren't sure if your car can use a range of different viscosity oils. Most car manufacturers consider it acceptable for an engine to burn a litre of oil every 1000 miles or in some cases, 1000km. While topping up the oil at that frequency may be annoying and possibly expensive, there is generally nothing to worry about. Using a full synthetic oil may help to reduce oil consumption if a mineral or semi-synthetic oil is being used. Mineral based oils consist of a mix of different sized molecules and the smaller ones can evaporate and then burn relatively easily, increasing the rate of oil consumption. The molecules in synthetic oils are uniform, so they are less likely to evaporate and burn. My car is only being used on the road - do I need a full synthetic oil? It depends on the car. If a car requires a 0w-x grade of oil, then it must be a genuine synthetic oil as it is impossible to make an 0w viscosity oil from mineral oils. Even in cars that do not need oil that meet the above criteria, most of the time a synthetic oil is a preferable option as they give better protection and last longer. This is very relevant in engines used on track. Will using a certain oil help my engine to make more power? When a top quality oil of the correct viscosity is used, a vehicle may actually have a higher power output at the wheels than with other oils. The'gain' in power is actually a reduction of the power lost in the engine. Internal resistance due to pumping losses and viscous drag and friction is where power is lost and minimising those will lead to more efficient running. Using a good oil reduces the friction as well as increases the protection. A common approach to lubricating a powerful engine is to use as thick an oil as is available, but that adds to the internal resistance as the engine has to work harder to move the oil. That can also lead to increased wear in the engine as the oil does not flow as well as the engine would like. Often an increase in the quality of the oil used rather than the viscosity will be sufficient for many modified cars and that will actually give better protection as well as a slightly increased power output. Automotive oils are naturally clear, not the amber colour that people assume they are. The reason they are often amber coloured is due to a dye manufacturers add and is only added as people assume oils should be a certain colour. There are many oils on the market that differ from the'norm' and this is simply due to the addition of different coloured dyes. The dyes have no actual benefit to the oil, other than making it stand out as different to the rest. Why does my oil turn black? As well as lubricating an engine, another important feature of oil is that it cleans, removing combustion by-products from the engine and keeping them in suspension in the oil. This prevents the by-products from settling and building up as deposits in the engine. Should I use an oil flush? In the vast majority of cases, there is no need to flush the engine and flushing can be harmful. What can happen is the flush can loosen harmless deposits in the engine, but then not remove them. Your new oil goes in and after it gets warm and is flowing nicely, the bits which are loosened come off into the oil, so you end up with hard bits floating around in your oil - the last thing you want! If you really want to flush the oil system, the best thing you can do is drain out the oil that is in there, put in some basic mineral oil and run the car for a short while so the oil gets nice and warm. After running it, drain out the mineral oil and put in the correct oil. What oil should I use to run in an engine? A basic mineral oil should be used for running in as friction between the piston rings and cylinder linings is needed to allow the engine to bed in properly. If a synthetic oil is used, it prevents sufficient friction being generated and can lead to the bores becoming glazed. That causes a loss of power and increased oil consumption. We also sell specialist running in oil and trouble-shooting products to assist with running-in. My garage recommends a brand of oil in my car, you recommend something different. So is our recommendation safe to use? The item "LASER Locking Wheel Nut Key Set Mercedes Benz 30pc Single" is in sale since Wednesday, October 24, 2018. This item is in the category "Vehicle Parts & Accessories\Garage Equipment & Tools\Hand Tools\Other Hand Tools". The seller is "opieoils" and is located in Redruth, Cornwall.